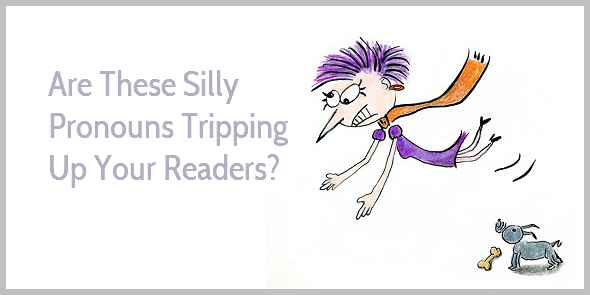 4 Common Mistakes With Pronouns: Are You Tripping Up Your Readers, Too? Ever had a tiny pebble in your shoe? You walk on because the pebble is so tiny, you hardly feel it. You don’t want to untie your shoelaces, take off your shoe, remove the tiny pebble, and then put your shoe back on. Too much hassle. But after a while, the tiny pebble gets more irritating. Should you stop walking and remove the pebble? In writing, silly mistakes with pronouns are like that tiny pebble. They irritate your readers. They may stop and check what those little words refer to. Or they might read on without understanding the meaning of your sentence. Whatever your reader decides to do, you’re making a bad impression because your bumpy writing is slowing your readers down. Want to create a smooth reading experience? Let’s look at the most common mistakes with pronouns confusing your readers. Pronouns are words like me, she, him, it, we, you, mine, her, our, himself, who, and whichever. These words refer to a person or a thing without mentioning it by name; and that’s exactly why sometimes problems arise. As a writer, you need to make it absolutely crystal-clear to whom or what the pronoun refers. Shall we have a look how pronouns trip up your readers? When writing, we know what we want to communicate. But sometimes we forget that our readers don’t know our story yet. They discover the story sentence by sentence. And that’s why writing can be tricky. We know what we mean. But our readers get confused. Mistakes with pronouns irritate your readers, requiring them to stop and check what they mean. The first pronoun is “your.” As I’m writing to you, you know whom “your readers” refers to. That’s fine. The second pronoun is “them.” The phrase “requiring them” follows closely after “your readers,” and it’s pretty clear “them” refers back to “your readers.” So that’s okay, too. Mistakes with pronouns irritate your readers, requiring them to stop and check what these words mean. A good flow hypnotizes them because readers enjoy the smooth experience. A good flow hypnotizes readers because they enjoy the smooth experience. To avoid irritating your readers with tiny pebbles in your sentences, check whether it’s clear what each pronoun refers to. Have you ever had a hole in your sock? As you’re wearing shoes, nobody sees the hole in your sock, so it doesn’t matter. But it becomes embarrassing when you have to take your shoes off in public. Perhaps at airport security. Or at the doctor’s. When I started working as a freelance copywriter, I thought people would be impressed if I sounded like I was a real business. I also fell in the trap of using “we.” But I discovered people hired me because of who I was, not because I was pretending to be a bigger business. Today we’re a profitable company with 8 figures in annual revenue that’s growing fast. But our mission has never changed: We’ll help you create the kind of audience-focused content that helps you reach your business goals. And don’t be embarrassed for running a solo-biz. Be proud. In face-to-face conversations, we automatically use the word “you” to engage our conversation partners. Join our email list, and we’ll send you our guide to help you learn how to use pronouns. Learn how to use pronouns correctly. Sign up now and get your free guide. To spot self-important sentences, look for the sentences with “I” and “we.” See whether you can focus on your reader instead. Focusing on your reader makes good business sense. When AwayFind, for instance, changed their subhead from the self-important “Let us find your urgent messages” to the you-focused “Get away from your inbox—let urgent message through the clutter and find you … instantly,” sign ups increased by 91%. A good writer engages her readers—even when she can’t see them. She writes a little about herself, and she remembers to address you, personally. Imagine you go out for a walk with a friend. And your friend has a tiny pebble in her shoe. She doesn’t want to stop. But she keeps complaining about the pebble and her sore toe. Instead of enjoying the beautiful sunshine, you listen to her endless grumbling. Feeble pronouns, like “it” and “there,” are like that endless grumbling. These pronouns don’t confuse your readers, but they weaken your sentences, and they can spoil a pleasurable reading experience. There’s a way to become more enchanting. There’s no hope for lazy bloggers. It’s easy to trip up readers when using the wrong pronouns. It’s hard work to write a blog post every week. But it’s also fun. You can become more enchanting. No hope exists for lazy bloggers. Tripping up readers is easy when using the wrong pronouns. Writing a weekly blog post is hard work. But it’s also fun. In the last sentence, it refers back to writing a weekly blog post, so here the reference is clear. Take your reader by the hand. Imagine he doesn’t know your story yet. So tell him precisely what you mean, and avoid all ambiguity. Good writers communicate with piercing precision. PS Thank you to Aaron Orendorff for inspiring this blog post. Wow! What a post. I never realized pronouns could be so tricky. Thanks for the lesson. Brilliant. Simple and useful as always. Thank you! Thanks for such a helpful post. I never realized these pronouns would be so damaging. The examples are very clear and now I know how to make my writing smoother. Ever since your blogging course last year, I’ve been looking for any sentences I’ve started with “It’s” and “There”. That tip (#4) works a treat. Also, just wanted to say how fantastic your 2015 blogging course was. Signing up was easily the best decision I made last year. Almost everyone starts a lot of sentences with “it” or “there.” I do, too, but I’ve trained myself to re-arrange them when editing (or even while writing my first draft when I notice it). As I was reading this, I couldn’t help think of all the pronouns I’ve used that has weakened my writing. Particularly the “it” and “there”. Those really do make sentences sound feeble and weak. Thanks so much for this lesson. It’s amazing how these little things can make a world of difference. Have an excellent day and week. An informative post Henneke particularly on Feeble pronouns. Most About pages are all “we” and “us” orientated – hardly a word about what they can do for their potential customer. Yep, so true. As default, we write from our own perspective. We need to practice discipline and focus to take our reader’s perspective. Thank you for stopping by, Mark! Shouldn’t “them” be “they” (the third pronoun in your example above) ? You always give me some things to think about Henneke. I have been guilty of the I and we power trip. I thought only me was not good enough. Now I am proud to be solo. Isn’t it eye opening how one and two letter words can effect the entire blog. My take way from this writing is that each and every word counts when writing. Pronouns included. It’s easy for a writer to assume that the reader knows what the writer means but that assumption can be a killer. As you so adeptly point out. When I first started I sat down wrote my blog went over it for errors and hit publish. Maybe 45 minutes maximum. Now I try to “take my reader by the hand” and be precise. It takes time. Since I started reading you and other very good bloggers it now takes me more hours to publish than I am willing to admit here. I have come to the conclusion that “No hope exist for lazy bloggers”. Your image at the top is great. I love it. If you every get tired of this internet thing I think you could be well with your art. Yes, it’s true that good writing takes time. But when you write more and settle into a structured way of writing, then you can speed up the process quite a lot. (I’ve also find that the more I write, the more critical I get, so that makes me slow down a little again ;-)). Pronouns can spoil our writing if used excessively. We need to practice to write according to the superb examples given by Henneke. Thank you Henneke for this nice lesson. Food for thought and digesting for sure, Henneke, love it. So much is in the written word, and it is an art to make written expressions easily digestible without confusion. Thanks for this valuable lesson. Tweaking is the name of the game! Yep, tweaking is a good word! A few tweaks can make a big difference. Another rock solid post down. You can’t imagine how much my writing has improved by following your tips and posts. This issue with pronouns is so tricky. Sometimes in abid to sound professional, we use too many pronouns. I have become better at spotting these mistakes. Talk about the enchanting power of pronouns … and mysterious, simple QUESTIONS! What a great two-for-one insight on (yes) pronouns … but (more so) authenticity! Henneke – you just ruined my day! I checked how I use “it” and “there” in a few of my writings, and I am guilty as charged. I will spend the next few days cleaning up. Last week you asked why your readers read your blog. My reason is you seem to have the inside track on literary insight. Thanks again for another useful blog. I’m so sorry for ruining your day, Paul! Watch out for “it” and “there” at the beginning of your sentences. The ones in the middle are usually okay. Pronouns? Tricky? That’s weird…. so so weird! Writing is weird, isn’t it? Yes! I’ve got some rubbish i need to change else my life ruins. Thanks for this “weird” eye opener. I’ve got your blog on RSS and read almost every one of your blog posts. I’ve got both of your books on Kindle and read and reread sections of them. I’m in love with your art work. I’ve got to tell my wife. Thank you, Dara. In my experience, #3 becomes natural over time, but #4 is one I have to keep watching out for. Happy writing! I took a look at my posts and realized I was guilty of pronoun “sins”. I’ll have to spend some time cleaning up my writing. I’m a solo entrepreneur in Brazil, trying to impress my customers and they don’t know I run a solo-biz. I use “we” all the time and, after reading your post, I feel a bit embarrassed for not using “I”. Don’t feel embarrassed. Most of us have done the same. Change it, and see how it sounds? Nice to meet you, Piers! I love your wisdom that I can be enough! I am off to change my ‘we’ pronouns because let’s face facts, if anyone hires me, they hire me and not a team of ‘we’s! I really enjoy your posts Henneke, but this (fanfare) is my first comment. Grammar is so important and often neglected! Great review on the use of pronouns! I always find your ‘before and after’ examples really helpful, Henneke. Your samples bring the point home! Your Call To Action example is an eye opener. Just realized I’ve focused too much on me instead of my readers! You’re not the only one. I see a lot of people doing the “we” instead of the “you” version. I was just writing a post and used the word them. Your post came to mind and I changed it to be more precise. I’ve always heard IM is about helping people. I thought you’d like to know that you are helping me become a more precise writer. Thank you for writing this post. The examples helped me understand how important it is in writing a sentence to have a meaningful and interesting flow for the reader. Yep, that’s right the flow of each sentence is important for keeping readers engaged. Thank you for stopping by, Marti! You pointed out some important but often overlooked mistakes. I like the examples you used to explain the mistakes, and the solutions are simple and actionable. Thanks for sharing. Also I agree on the use of “we”. I have noticed many one-man-shows doing like that. I assume maybe that’s because they’re also taking into account the people they work with like freelancers, JVs etc. Then again, I’d rather they use “I”. It makes your business personal.